How Lincoln wrote his great speech--told by someone who was there. How Lincoln wrote his great speech–told by someone who was there. 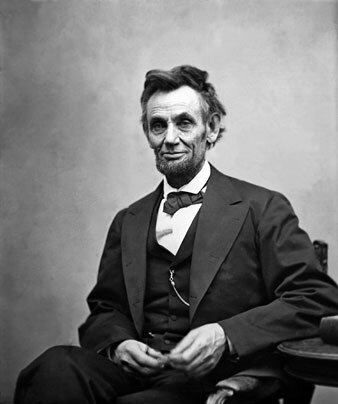 SIR : In the Nation of August 20 is an enquiry for the manuscript of President Lincoln’s Address at Gettysburg. Mr. Lincoln arrived in Gettysburg in the afternoon of the 18th of November, 1863, and was a guest of one of our citizens—Judge Wills. He was called out in the evening to reply to a serenade, and at a late hour went to his room. Sending for his host, he enquired the order of the exercises of the next day, and began to put in writing what be called some “stray thoughts’ to utter on the morrow. When delivered, they were read from an official letter-sheet. It is uncertain whether this manuscript has been preserved. But when Mr. Lincoln was asked, in April, 1864, to send to the Baltimore (Md) Fair for the relief of soldiers end sailors an autograph manuscript, he sent a copy of his Gettysburg Address, which, lithographed, is to be found on pages 3, 4, and 5 of ‘Autograph Leaves of our Country’s Authors’ (Baltimore : Cushings & Bailey. 1864). Every word is written with distinctness and care; and there is no room for mistaking even a letter or a punctuation-point. This is, undoubtedly, the final form he gave the Address, and is that by which he intended it should be judged. I enclose an exact copy. Gettysburg, PA.. Aug. 31, 1875. “Now we are engaged in a great civil war, testing whether that nation, or any nation so conceived and so dedicated, can long endure. We are met on a great battle-field of that war. We have come to dedicate a portion of that field, as a final resting-place for those who here gave their lives that that nation might live. It is altogether fitting and proper that we should do this. “But, in a larger sense, we cannot dedicate—we cannot consecrate—we cannot hallow—this ground. The brave men, living and dead, who struggled here, have consecrated it far above our poor power to add or detract. The world will little note, nor long remember what we say here, but it can never forget what they did here. It is for us the living, rather, to be dedicated here to the unfinished work which they who fought here have thus far so nobly advanced. It is rather for us to be here dedicated to the great task remaining before us—that from these honored dead we take increased devotion to that cause for which they gave the last full measure of devotion—that we here highly resolve that these dead shall not have died in vain—that this nation, under God, shall have a new birth of freedom—and that government of the people, by the people, for the people, shall not perish from the earth.